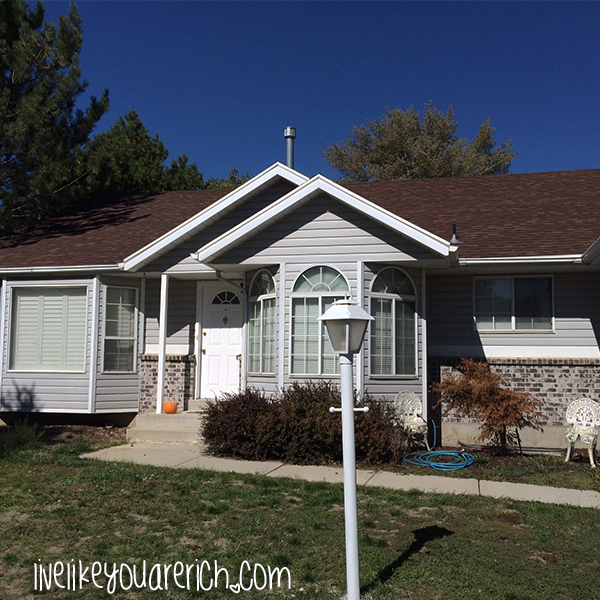 Our house is mainly white with blueish-grey siding and brown shingles. But our mailbox and lamp post are black and I really dislike the clash. 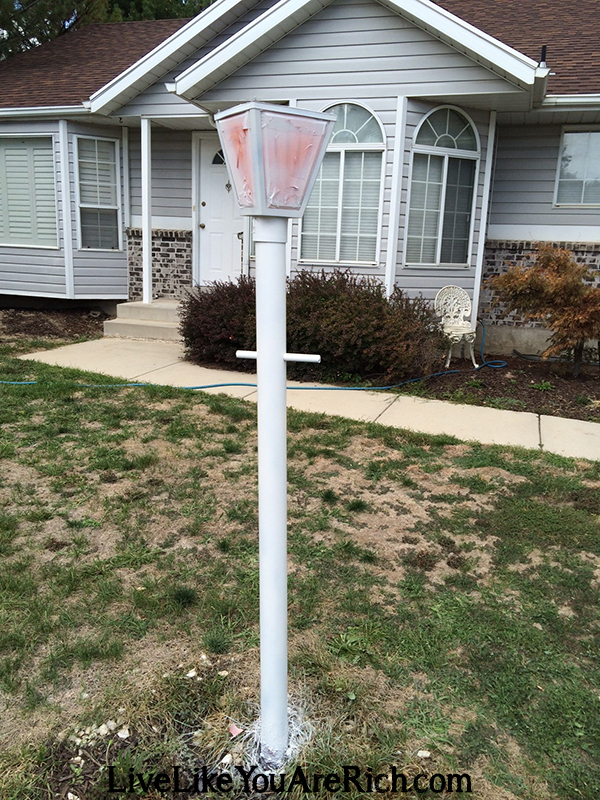 So instead of buying a new lamp post, I decided to spray paint it. Below you will find steps to how to paint a lamp post. Please ignore our grass/weeds in these photos. We have been trying to revive our lawn since we bought the foreclosed upon home (with completely dead grass). Since we had no luck growing grass, only weeds, we decided to re-sod it completely next spring, thus it is really ugly right now. Step 1: Make sure the weather is right. 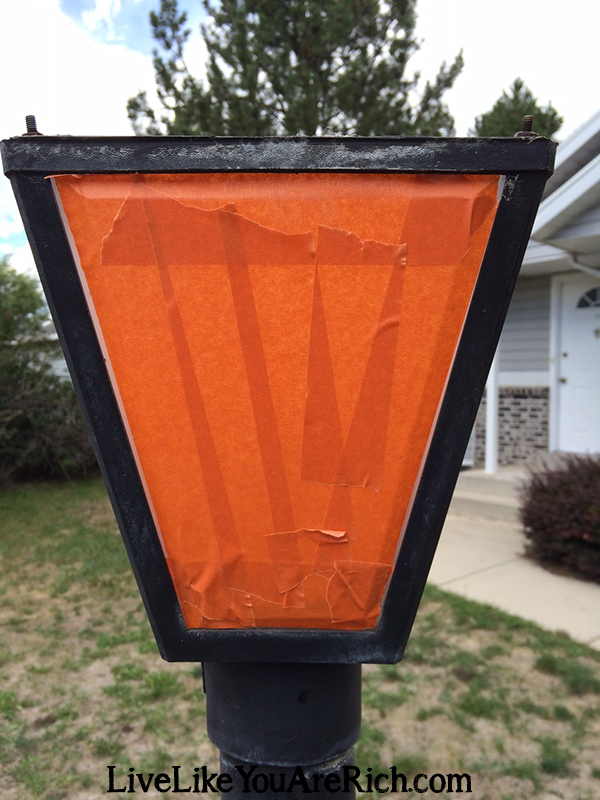 You don’t want to spay paint a lamp post if the humidity or heat is too high. You also don’t want to spray paint in the cold either. Follow the directions on the cans of primer and spray paint. I primed and painted when it was about 70 degrees outside. Typically spray paints will say that temperatures should be between 50-80 degrees Fahrenheit. Avoid painting when humidity is higher than 85%. It also best to avoid painting in direct sunlight. I painted on an overcast day which was good because the metal wasn’t too hot. Step 2: Wash the item you are going to paint really well. I sprayed it with our hose and used a scrubbing pad on it. Let it dry out, or dry it completely. Step 3: Tape off anything you do not want painted. I taped off the lamp post windows. Step 4: Put newspapers around the base so that you don’t spray paint the lawn (if you care). I did not do this because I don’t have a lawn that I care about at the moment. Step 5: Remove any nearby items you do not want over spray getting on (a vehicle parked in the driveway, a bike, etc.). Step 6: Prime the lamp post. 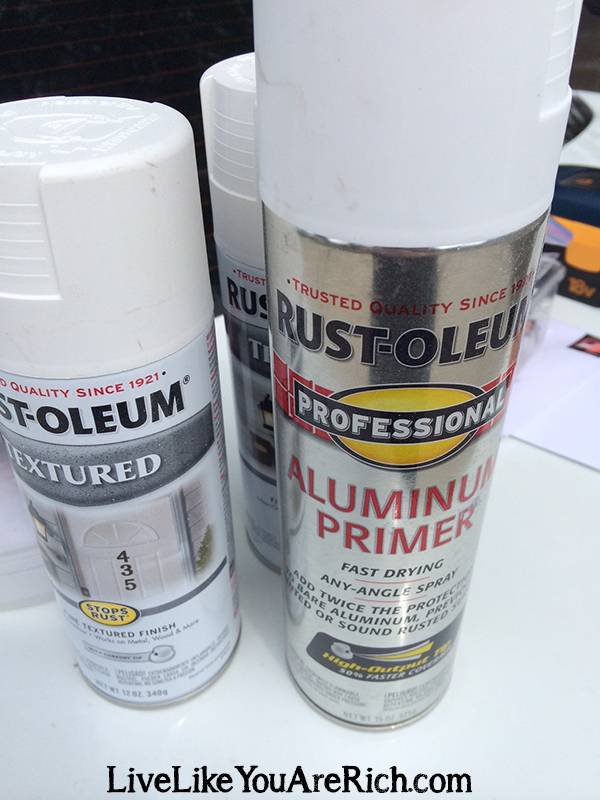 I used Rust-Oleum’s aluminum professional primer. 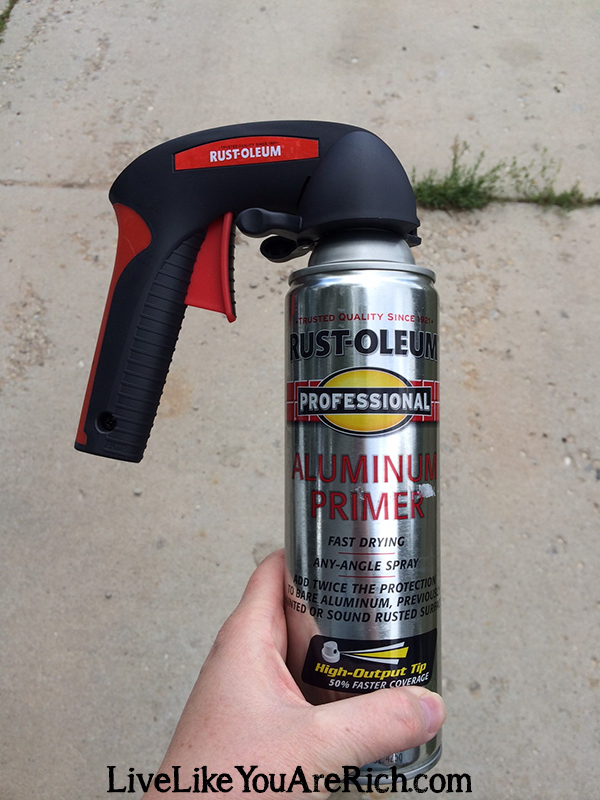 I love using the Rust-Oleum’s spray paint handle/grip. It really makes the process go so much faster and are much easier on your hands, fingers, and wrists. Allow primer to dry for the recommended time in between coats (15 minutes or so depending on brand). Add a second coat of primer. Step 7: Once the primer is dry (about 15 minutes depending on brand). Add the final coats with the type of paint you want. 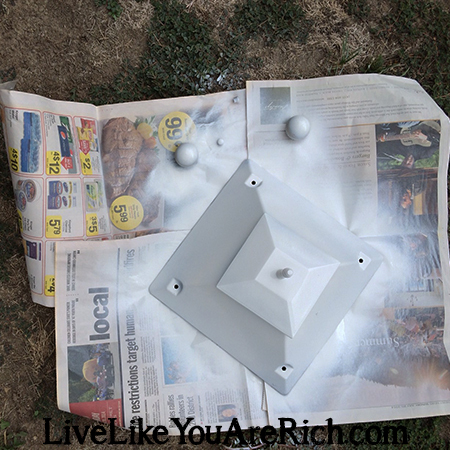 I used Rust-Olem Textured outdoor white spray paint that stops rust . It is very important to spray lightly and to follow directions on the cans. I ended up adding about 2-3 light coats of spray paint on top of the primer. Step 8: Allow to dry and check for any really light areas, touch up. Step 9: Follow the same instructions on the top of the lamp post, hardware, and/or other parts of the lamp post. Step 10: Remove tape and newspaper. 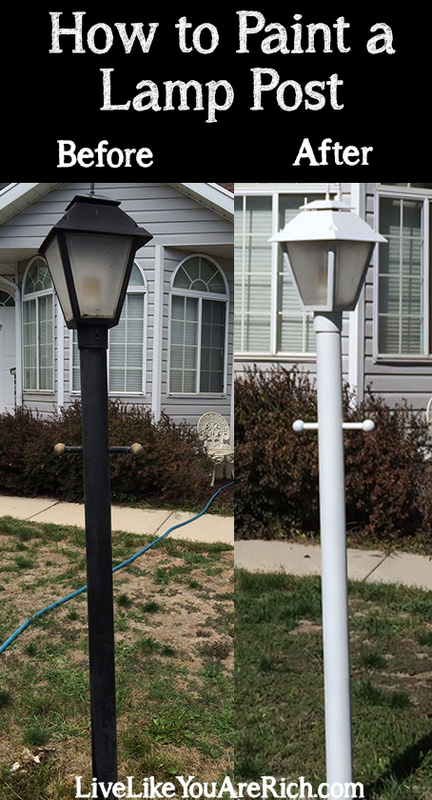 I painted my lamp post over one month ago and despite, hot days, heavy rains, and lately frost, etc. it looks just like the day I painted it. The paint job is holding up really really well. The best part? 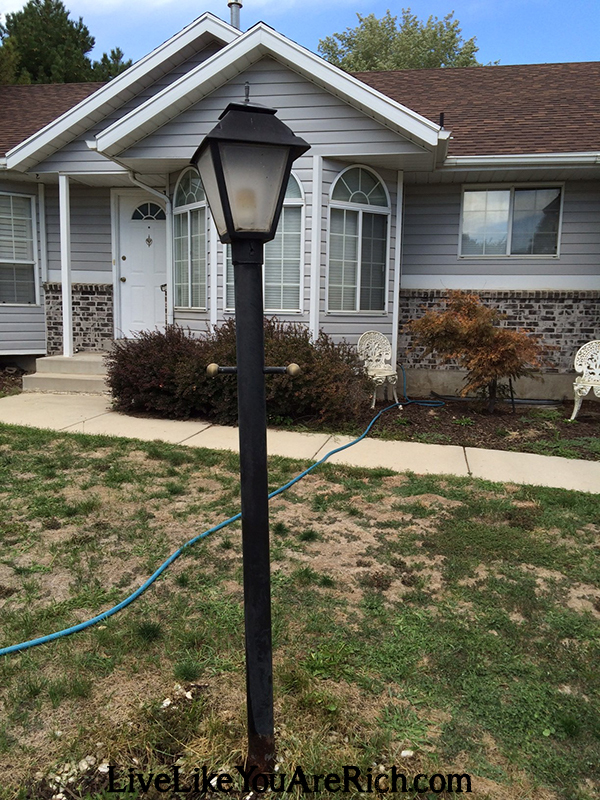 Now my lamp post looks new, matches my home, and doesn’t stick out like a sore thumb. Enjoy your project. If you have questions/comments please leave them below. 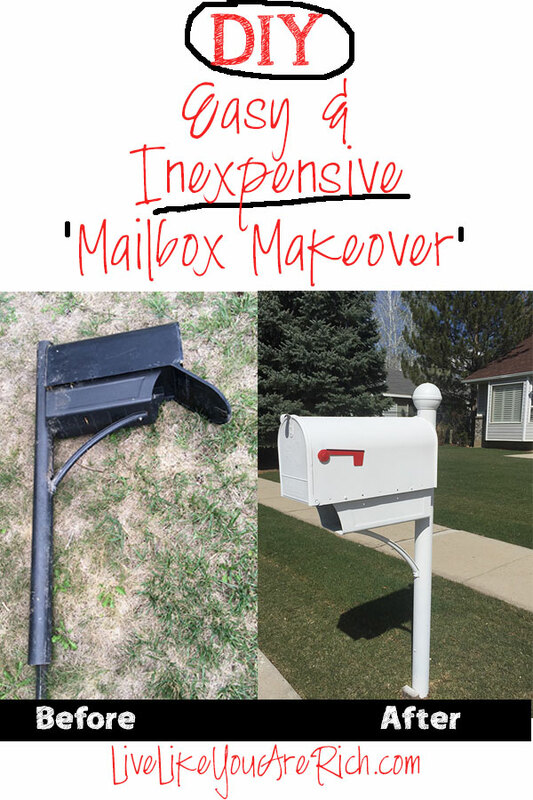 Here’s the before and after on our mailbox transformation… plus our new lawn. Thanks for this, it is very timely. 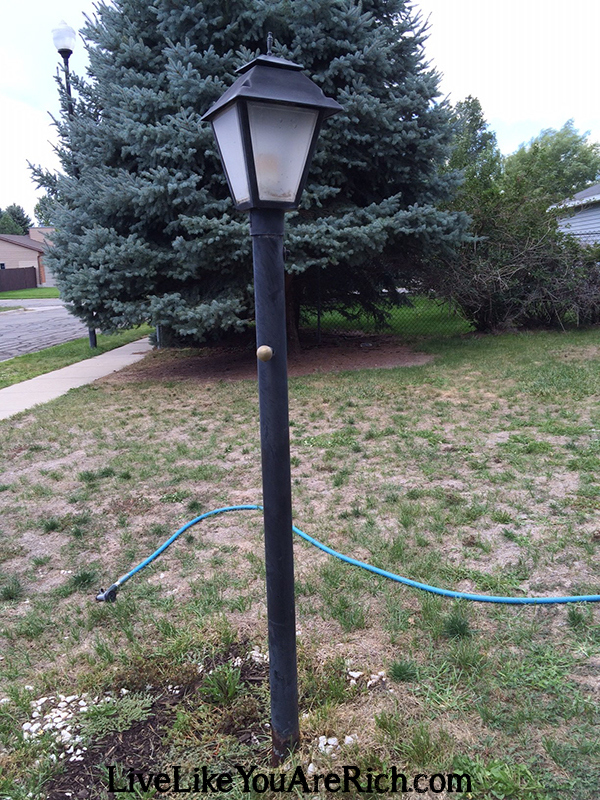 I was just looking at how the lamp post in our new house really needs to be repainted. Do you have any suggestions for dealing with rust? Hi! I’d hand sand and smooth off the rust as best as you can with some sand paper and then proceed with the following instructions and just paint over what you can’t get to come off ;). That’s maybe not the most professional advice but what I’d do personally. What is the method for spraying the pole? Do you go back and forth across all the way down one side then move over, or go all the way around and then up while circling? Thank you for your post! Thank you for sharing how to paint a lamp post on Think Tank Thursday. I too have a black lamp post and think that it would look much better a different color. Shared and pinned. How many cans did it take of each the primer and the white coat?